Over 40 Amateur Of The Week: Paul Put Age In Its Place! Mother Nature is in for a fight against Paul. He's on a mission to defy time and get better with age. By the looks of his shredded physique, he appears to have the upper hand! I started weight training at age 15 because I liked the look of people in bodybuilding magazines. I went to the local leisure centre, asked to join, and they said I couldn't until I turned 16 years old, which was eight months away at the time. I left the leisure centre dejected and fed up, so I hatched a plan to go back the next day and tell them I was 16. I waited until a different receptionist manned the front desk and became a first-time gym member. I spent the next 25 years thinking I knew what I was doing; making a modicum of progress. At the end of the day, it didn't show the fruits of my labor. I spent most of my life around 190 pounds and 20 percent body fat, which isn't impressive at 5-foot-7. 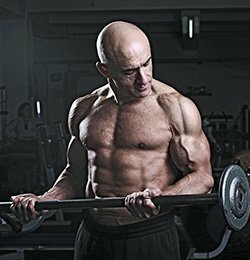 I spent time in Vancouver, British Columbia, at age 20 and trained at Gold's Gym where I saw good gains, but my training and nutrition were still misguided (the Internet didn't exist yet and resources like Bodybuilding.com were nonexistent). I continued training regularly during my 20s and got up to 203 pounds with mostly body fat. At age 30, I looked to change my fitness plan and came across an advert for a kickboxing class in the back of a local paper. It was January and my New Year's resolution was to use kickboxing as my way to stay fit. Little did I know that the coach, Gintas Bukauskas, had just come to the United Kingdom from Lithuania where he was a no-holds-barred champion. Kickboxing was only a way for him to make money. His real passion was mixed martial arts. No one had heard of MMA and I was amazed at how much knowledge Gintas had to share. I trained with Gintas for five years before the throws, kicks, and punches started to outweigh the enthusiasm I once had for the sport (I'm still good friends with Gintas, but didn't feel that type of training was conducive to a long and injury-free lifestyle). Around that point, I all but stopped training and put on 20 pounds of body fat. It was the heaviest and unhealthiest I had ever been. As a personal trainer and clinical nutritionist, I set a bad example. One afternoon, I was talking to another trainer in the gym and said that no matter what I did I couldn't lose weight. The trainer asked, "Do you think you could stop drinking for four weeks?" I said, "Of course." That was five years ago and I haven't touched a drop since. The weight started to drop off immediately. I didn't understand insulin resistance, glycemic load, or body fat stores then; all I knew was the weight was coming off. The more that came off, the more I wanted to understand why so I could spread the word. I now teach weight management courses, which I developed and are successful for clients. By January 2012, I thought I was in good shape. I trimmed down to 175 pounds and 13 percent body fat. In April 2012, I came across two pieces of information that got me into the best shape of my life within eight months; Dr. Layne Norton's PHAT and Rob Riches Daily Nutrition Planner. PHAT training broke my old training habits and got me training each body part twice per week. 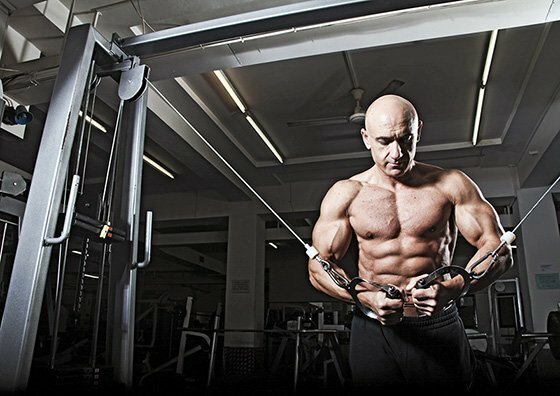 This resulted in impressive gains in only 12 weeks and improved my overall conditioning. With Rob's Nutritional Planner, I was able to plan my daily intake of macronutrients effectively, which gave me an edge to start seeing significant changes. In August 2012, I decided to sign up for the Rob Riches Fitness Model Workshop in London, which was held in December. I liked the idea of the weekend because it included information on marketing through social media and a photo shoot. At the same time, I trained clients who competed in national bodybuilding competitions and watched them go through hell while dieting. I knew there had to be a better way to drop the weight without feeling horrible, so I decided to diet in preparation for the upcoming photo shoot to prove it. I gradually reduced my carbohydrate intake each week throughout 16 weeks and the result was steady fat loss with only two cardio sessions per week. I was pleased with the results by the time of the shoot. During the weekend workshop, another challenge was set to see how much body fat I could lose in two weeks (January 2-16, 2013). I adjusted my nutritional plan, increased my cardio, and lost around three percent body fat to reach my best condition ever. I looked better at age 46 than at any other time in my life. I had another photo shoot on the January 16, 2013, and saw marked improvement from the shoot four weeks previously. I decided to spend the next three months gaining size and improving weaker areas before dieting again for another shoot in September. My best gains came from PHAT. Anyone looking to make gains in strength, lean muscle, and conditioning should try it. I did it for four weeks followed by a one-week rest cycle and then developed two more four-week cycles after that. Rob Riches Nutrition Planner came to the rescue and totally changed my eating habits. The best combination to lose body fat in preparation for my last photo shoot was a macronutrient split of 45 percent protein, 30 percent carbs, and 25 percent fats. For growth, I used a split of 35 percent protein, 50 percent carbs, and 15 percent fats. To prepare for a photo shoot, I start 12 weeks out and reduce my carbohydrate intake each week by eight percent until I hit around 90 grams per day total. This produces about one pound per week of fat loss while still having energy to train and work. This diet shows a typical day 12 weeks out from a photo shoot. My drive comes from being the best 46-year-old I know; to look and feel like I did in my 20s and lift as heavy as I can. Every now and then a guy walks into the gym and makes me think, "Wow, I still have a way to go." but it makes me go back to the drawing board to tighten up my nutrition, tweak the training, and push harder. I love that we can manipulate body shape, size, and strength by following rules in a particular order. I'm always fascinated with the sport. The sport is in the gym, the art is in the posing, and the competition is on the stage. Motivation comes from being exceptional for my age. Having much younger guys come up to me and say they want to look like me is a real buzz that makes me want to improve. Albert Beckles competed well into his 60s, so I have many years left to improve. I also love seeing new videos on YouTube showing variations of old exercises and calisthenics. One that's making a big comeback is the "flag." My inspiration comes from people I surround myself with and athletes who push hard and don't give in. Being around the right people keeps you inspired to be a better person. My future plans are to build a company that specializes in the over-40 training and nutrition market. I want to build a place where every athlete comes for cutting edge information to look and feel amazing. People need to know age is just a number. Be consistent in your approach. Make sure every meal, training session, and hour of rest is the best it can be. Then just sit back and watch the results. I grew up in the era of Lee Haney, Rich Gaspari, and Cory Everson; all of which inspired me for different reasons. Then Dorian Yates brought a new level of intensity to the game. More recently, it was Jay Cutler and Ronnie Coleman who battled it out. Today, Kai Greene is interesting to watch; not only in training, but his philosophy. It's on another level, and for that he has my respect. 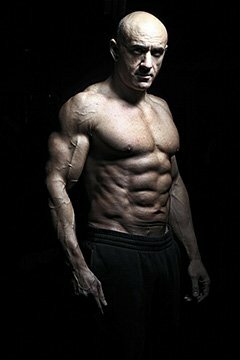 Bodybuilding.com is the go-to place online for everything. It helped me find the right training programs with in-depth articles on nutrition and supplementation. The site allows me to make up my own mind about products. It's as if I have thousands of coaches to ask any question. That is invaluable.